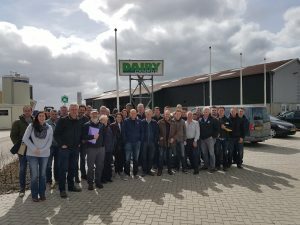 From 4th – 6th April a UK group of 9 dairy farmers, 3 researchers and 2 AHDB staff visited the Netherlands to learn about housing and bedding innovations and best practices. The overall objective is the exchange of knowledge and fostering co-operation between different countries as part of the EuroDairy network theme alternative housing. Day 1 started with a visit to the so called Cow Garden in Groenlo and a presentation of Carel de Vries, manager of Courage the innovation engine of the Dutch dairy sector and one of initiators of the Cow garden. He described the innovation progress and made clear innovation needs courage (hence the name Courage) and real entrepreneurs who believe in an innovation. The second presentation was given by Erik Lindeboom, manager of ID Agro a company who designs and makes new types of housing. One of their designs is the so called Cow Lounge®, a steel structure stable with a roof consisting of synthetic sheeting resulting in the ideal amount of daylight. 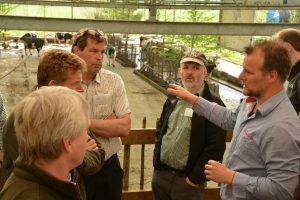 Chris Boomers told why he invested in a cow garden (in Dutch Koeientuin) for part of his cows and his experiences so far. The feces and urine are separated on an artificial floor. Trees are added to create a picture attractive to the public. The second day 5 farms were visited. First the Batenburg te Giethoorn of Jeanet Brandsma and Peter Aalberts was visited. One of the issues discussed at this farm is the use of green bedding (recycled manure solids) in the boxes. In the UK the use of green bedding is only allowed under strict conditions. One of the themes at the farm of Marco de Jong in Langedijke was the use of sand in the boxes and a sand separator. Afterwards a short stop was made at the farm of Heida at Hoornsterzwaag to see the new developed Cuddle box in practice. This box consists of a cow and calf section. The cow has easy access to the new-born calf and is able to lick the calf and eat silage. Hubert Timmermans of Spinder dairy housing concepts gave a short presentation of the activities of his company in general and the Cuddle Box in more details. After the lunch the farm of Jolle de Haan at Niekerk was visited. He holds 130 cows and built in 2011 a so called freehold barn with 1,800 sq m bedded (wood chips with aeration) area and 500 sq m slats at the feeding alley. The last farm visited was the farm of Koert Tromp at Houwerzijl. A farm with milking robots and automatic feeding. 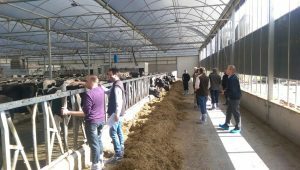 The third day we visited the DairyCampus in Leeuwarden. There were also 18 dairy farmers from the Netherlands EuroDairy groups joining us, and three people of the ZLTO. First we started with a general presentation of Eke Folkers about the history en today about the DairyCampus. After that Paul Galama, researcher… had a presentation about free stalls. An interesting presentation with a lot of different flour types and housing systems. Then It was time for the tour around the barns of the DairyCampus. We saw the different beddings they are testing but also the milking parlour and a quick look in the ammonia testing barn. Than it was time for a discussion between the NL and UK dairy farmers. There were a lot of discussion points about the free stalls and different types of bedding, but also about the consumer of these days and the phosphate discussion in the Netherlands. To end the day there was a lunch for everyone and after that we took a great picture with everyone. During this exchange visit Dutch farmers journal 'Nieuwe Oogst' made a short video: https://www.youtube.com/watch?v=SCzjeb-bMpg&feature=youtu.be.